We are pleased to introduce our new fully qualified air tester, Adam Reel to our team and publish his first blog. A few months ago, I was studying engineering at university with no idea what I wanted to do with myself or where to go with my career. Fortunately, Phil and Mike found me and offered me a job I couldn’t refuse! I had never heard of air testing when they first approached me, but very quickly I was introduced to this fascinating field through attending a training course with Stroma. Here, I learned the ins and outs of everything to do with the job, from an in depth analysis of how the air pressure scores are calculated, to the practical side of running the test. The course was well run by Paul Carling who has a vast amount of knowledge to share with everyone on the course. That was the beginning of my learning curve. I have since been shadowing both Mike and Phil over the last two months. This invaluable experience has taught me that air testing is not just about setting up the equipment, running a test and then going home. On many sites it involves working with the client to identify and make sure that all the areas of air leakage are sealed. This is done by assessing the property, firstly visually and then by depressurising the building and identifying areas of weakness. If necessary, also helping to seal with silicone, mastic and foam to ensure that the customer gets their air test score below the value that they need to successfully pass the test. My first couple of months have been a great experience. I have particularly enjoyed learning and then utilising my skills to the maximum. I have also enjoyed meeting and engaging with clients from all over the North of England and look forward to fostering continued business relationships. I found out this week that I have passed the air testing course and have carried out my first unsupervised air test. One of the first jobs that I went on was an air test up in Durham, where we tested a fantastic two million pound house, which I have to say was lovely. This is where I realised the ethos of Northern Air Testing that Mike and Phil had talked to me about. When we arrived on site, the developer immediately thanked us for coming at such short notice, but also expressed his concerns as to whether the property was going to pass. It turned out that the developer had forgotten to book his test in with his existing air test provider, who had tested the other eight properties on the site. He said that they were unable to attend for at least a week, unfortunately, handover was next day, with penalties attached for lateness. Phil explained to me that the booking had come in late the previous day and as the developer had explained his predicament, Phil had re-planned his diary to fit him in. This meant that we carried out an air test in North Wales in the Morning and then drove to Durham for the afternoon. Phil also reassured the developer that we would not just ”do an air test and provide a score, pass or fail, but would stay and work with the build team if necessary, to ensure a favourable result. Sure enough, when the fan was running, there was an area of weakness coming from under the kitchen units. Phil pointed this out to the developer and he had his labourer foam fill the offending area. (where the plasterboard fell short of the floor). Sure enough this did the trick and the fan speed dropped dramatically. I now have an understanding about how to run a successful business and put the customer at the forefront of what you do. When we left the site, I asked Phil about this job and he said this. If you provide a first class service then the first time customer is likely to become a repeat customer. I this case, knowing the predicament the developer was in I would have tested the property out of hours if necessary. The developer said he would use Northern Air Testing in future. Tips from : Air Testing Durham. To optimise our SEO we need to use the term Air Testing Durham at least four times in this post. Air Tightness Testing North West England. We have been in the North West quite a bit this week. A memorable test was one Phil did in a village just outside Ormskirk. (photo of the property above). This was a memorable property for two reasons, the first evidenced by the photo. It was a lovely large house set in its own grounds, overlooking the surrounding countryside ”sounds like estate agent speak but it was very nice” The second reason that it was memorable, was the preparation the owner of the property put into getting the property ready for the air test and the obvious attention to detail that must have happened throughout the build. The actual air test didn’t take long at all, as it was evident as soon as the fan went on that it was going to perform very well. I have talked about attention to detail in a previous blog, but I’m going to mention it again. We have noticed that when we test larger, high end properties, there is considerable attention to detail, especially with the finishes. However, more often than not, this attention to detail is lacking when you look just below the surface. An example of this is often found in the Kitchen, behind the wall units where the wall meets the floor or doesn’t. Custom and practice is to leave a gap at the bottom of the plasterboard, but if its just left like this, then air will escape through the gap. The same thing happens with the penetrations through the plasterboard behind units. We have seen all sorts, such as four inch core drilled holes for the electrician to pull his wires through, or where the plumber has drilled a larger than necessary hole for the sink waste. Its fine doing this but the holes need to be sealed back up once the wire or pipe is in place. Tis is the hidden attention to detail which makes all the difference on air test day. It keeps dirt and dust out and where there is a carpet fitted it keeps the edge of the carpet clean. It keeps the spiders out. A quick plug for the architect who was Paul Ennis based in Southport. Tips from : Air Tightness Testing North West England. Finish off each room in the same way. Then fit you kitchen, bath or shower. Maintain that attention to detail throughout the build and not just with the aesthetic finish. To optimise our SEO we need to use the term Air Tightness Testing North West England at least four times in this post. If you find yourself on this page have a read but don’t forget to visit our main site. 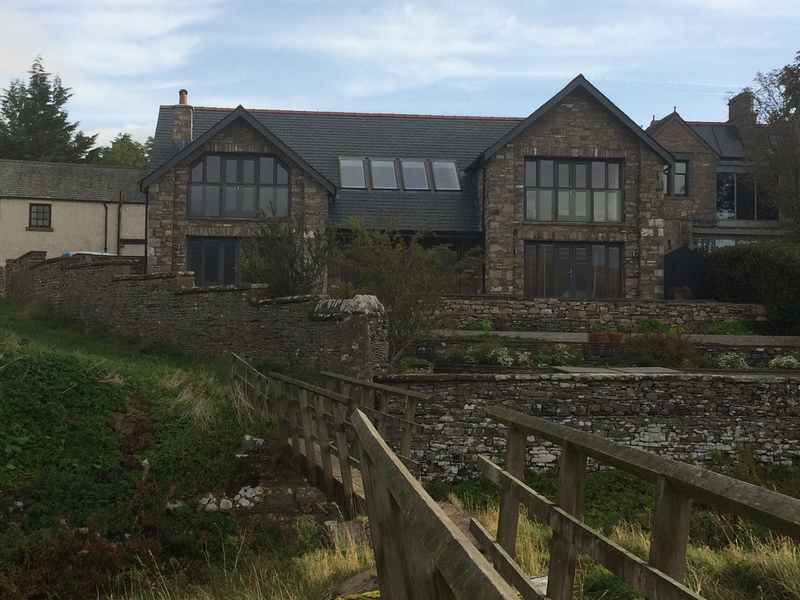 Phil was testing a fantastic detached house in Ravenstonedale Cumbria today (See photo) This was a fantastic example of a well built property that passed its air test without difficulty. Phil said that as soon as he walked through the front door it was obvious that things were going to go well. The quality of the finish and the attention to detail was excellent and this clearly continued throughout the build even in the unseen hidden areas. Attention to detail is a key factor in achieving a good air test score and if this detail is extended to those hidden areas such as behind kitchen units, baths, showers, built in wardrobes, then all will be well. What do we mean by the term attention to detail in air testing terms? Well have a look at our check list and it will give some clues, but the best thing to do is to think of each room as an empty box that you are going to show to your potential customers. The living rooms and bedrooms are easy, they can be shown once they are finished and painted, All they are, are finished plaster boxes ready to be dressed with furniture. But what about the kitchens and bathrooms? Our advice is to do exactly what you would do in the other rooms and finish them off properly before fitting the kitchen, shower or bath. Don’t do what has been custom and practice for years and leave the areas that will be hidden behind units unfinished, as this is where most air leakage occurs. To optimise our SEO we need to use the term Air permeability Testing Cumbria at least four times in this post. If you are building a new house, you will not only need to have an air pressure test, but also your extraction system will require testing, to ensure it extracts at the correct rate and conform to part F of building regs. Be very careful, relying on your installer certificating their own work, as in our experience, self certification is next to worthless. With todays stringent requirements relating to air tightness, it is massively important that your ventilation system is compatible with the air tightness of your home. If you are at the planning stage of your build, then this is a good time to contact us and we can advise on both, the design air test score and the appropriate ventilation system. Conversely, if you have set your mind on a particular ventilation system, then ask us about how you can achieve a compatible air test result. The most common mistake both self builders and experienced developers make, is fitting cheep system 1 fans, (extractors that only run when the light is switched on) without thought to the design air test score or the run of ducting required to reach an outside wall. Imagine the scenario. A well known and most commonly used extractor fan (I’m not going to name it) will extract at 15 litres a second in benign conditions (bench test). If it needs to extract through a ceiling and then out through an external wall, it will almost certainly fail to extract at the required 12 litres a second. This is because the ducting will have at least one bend in it, causing increased resistance to the air flow. Then a length of, usually more than a metre, of ducting, again, causing more resistance. I have personally tested fans that go directly through a 300mm wall and not extract at the correct rate. If you are wanting to fit individual fans in each of your ‘wet rooms’ we recommend always fitting system three fans, which are the ones that trickle constantly and then boost when you need them to. This is because the part F flow requirements are lower, as the fans are constantly trickling and therefore do not need to extract on boost at such a high rate. There are also system three fans that are adjustable so we can set them up to extract both on trickle and boost and cope with bends and greater lengths of ducting. Plan your ventilation at building design stage. Think about your ventilation system. Make sure it is compatible with you design air test score. If you are going to fit individual extractors, we recommend using system three. To optimise our SEO we need to use the term Ventilation Testing Part F at least four times in this post. Hear at Northern Air Testing we also test and commission ventilation systems. 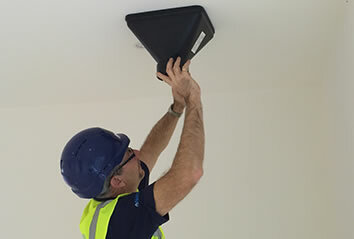 Ventilation is an area that is often overlooked during the planning and build process and often the cheapest extractor fans are used. We have noticed of late, that more and more developers are contacting us, asking if we are able to test and commission their extractors. They have only realised that this is a building regulation requirement (Part F) when the building inspector has asked to see evidence of the extract system being certificated. A common myth is that low air tightness levels can cause building sickness and poor air quality. It is important to match the air tightness target and end results with adequate means of ventilation. Low air permeability results, typically less than (5m3.h-1.m-2 @50pa) will require an assessment of the ventilation strategy. In Layman’s terms, if your design air test score is less than 5 (it nearly always is under the latest building regs) then our advice is to fit system 3 Fans. These are the fans that extract at a trickle rate continuously and then boost on demand, usually when a light is switched on or a sensor is activated. It is important to note that it is not good practice to mix and match your ventilation systems. So if you follow our advice and fit system three fans then this need to be fitted in all rooms requiring ventilation. A common mistake is where kitchen cooker hoods are fitted. These are classed as system 1 which means that you will also require a system three fan fitted somewhere else in the kitchen area. A great system three fan is the Greenwood Air Vac (unity). We recommend this fan for two reasons. They looks good and are adjustable. You can set the fan speed on both trickle and boost. This allows us to set the fans up to the required extraction rates and also allows greater force to overcome long lengths and bends in ducting. System one fans don’t allow for this and extract at one rate. All this can be confusing so your best bet is to give us a call and have a chat. we are happy to offer you advice on both your air testing requirements and ventilation. This way you will get it right first time. Remember that a good air test result is every trades responsibility, so if you download our air test check list and make sure you give a copy to every trade. Download our free air test check list. Check out our top tip page on the website. Book us at an early in your build and we will provide you with a free pre test site survey. Have multiple plots ready at the same time and it will save you money. Get an early on plot test done to identify if there are any issues with air tightness. To optimise our SEO we need to use the term Part F Ventilation Testing at least four times in this post. 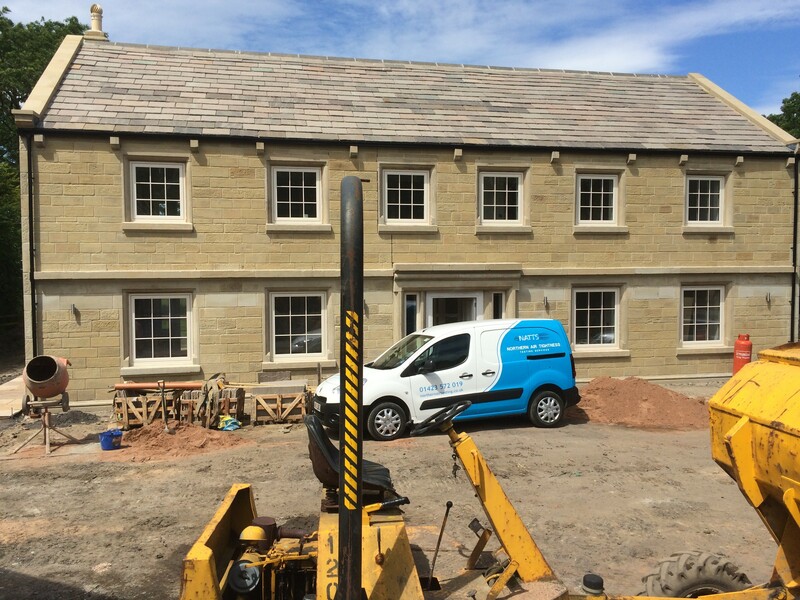 Mike and Adam are working in Nottingham all day today doing multiple tests on a development of social housing. If you have read our blogs or looked at our website you will probably realise that we offer fantastic discounts for multiple tests. So to give you an example of todays job and without giving sensitive information away, we have quoted to test up to four plots at £200 and then the remaining six at a greatly reduced price. We can do this, as our Philosophy is, that once we are on site we may as well test as many plots as we can as our cost both financially and time wise are in travel. A great way of utilising our service on large developments is to get an early ”one plot test” done. We will do this for you at minimal cost (as long as we are booked for future tests) By doing this we will be able to identify if there are any issues with the build in relation to air tightness and provide a report. This can then inform the developer and their team in regards to the remaining plots, which generally prevents the same issues recurring. Subsequently, when we then carry out multiple tests things generally go well. We are happy to provide on going support and believe that were are actually part of your team. We often get our customers ringing us to ask for advice and we are more than happy to offer it and its for free. We will provide you with a free air test check list at first enquiry. We offer free pre test site surveys. We are always on the end of the phone, where we are happy to provide you with free advice. We will work in partnership with you throughout the build process and are keen to develop good working relationships with all your site operatives. We will happily provide tool box training sessions. After all your property is only as good as the last person who worked in it. To optimise our SEO we need to use the term Air Testing Nottingham at least four times in this post. I am currently sitting in one of our vans on a Bellway site in Bolton, whilst Adam our latest newly qualified air test engineer carries out a couple of air tests. Adam has been shadowing us for a few weeks now and is gaining the hands on experience required to confidently work independently. However. As a company, we pride ourselves in providing a first class service and expect all our employees to meet stringent standards of customer service. We also expect them to behave in a professional manner and to have the experience to provide our customers with a quality air test. That is why we have a long probationary period and will only let our engineers ”fly solo” once we are confident with their overall abilities. Yes this can be costly and labour intensive but it is the best way to ensure consistence across our workforce. What do we mean by a quality air test? Well its quite easy to rock up on site, do an air test, get the score (pass or Fail) jump back in your van and once back at the office ring the developer and give them either the good or bad news. This sounds unbelievable but that is exactly what happens, based on what we have been told by numerous site managers and developers. Needless to say that is not how we work. A property that passes its air test. Once we have completed the air test we will discuss the results with the appropriate person on site. Be it the site manager or the developer. We will advise on the air test score but also point out any areas that could have been improved. 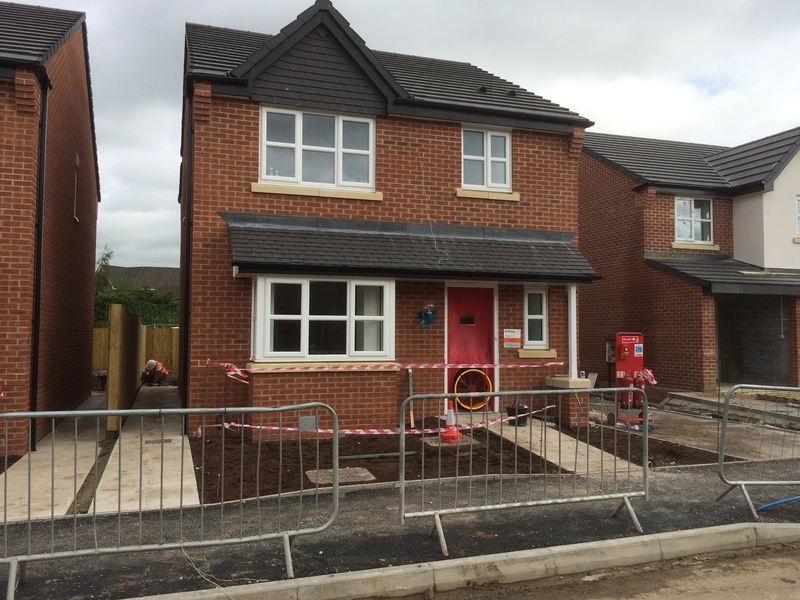 (example yesterday on a Taylor Wimpey site in Wales where the property performed very well. However, there was some issues with a couple of windows, where they had not been adjusted properly. You could not tell just by looking at them, but during air test we noticed quite a bit of drought coming from them. We pointed this out to the site manager and he was able to add this to his snagging list.) This is what we mean by customer service, where we will go that extra mile. In this example we may well have prevented a complain by the new home owner. So what about a property that either fails or is failing the air test? Well, what we definitely will not do is just pack up and leave. We can tell very quickly, whether a house is passing or failing, so the first thing we will do is do a visual check to identify where the air leakage is coming from. 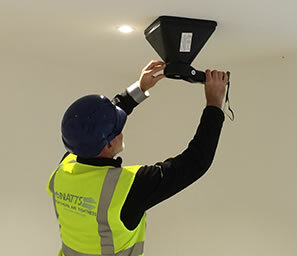 Quite often it is something we can address ourselves (we carry sealant with us so can rectify many areas of leakage, there and then) If there is remedial work required which is beyond our scope we will advise the site manager/developer and within reason give them the opportunity to carry out the work there and then. We can then re-run the air test at no extra charge and hopefully achieve a pass. On occasions where there is too much remedial work required on the day, we will provide a report outlining the areas that need attention and return another day. Our re-test charges are generally half the price of the original test. To optimise our SEO we need to use the term Air Testing Bolton at least four times in this post. Competitively priced air testing throughout the North of England. Prices start from £180 for an individual build and multiple plot discounts start from as little as £120. If you are reading this article, please have a look at the rest of our website. Click on the home page and then have a look at our top tips and down load our check list. These are both free and we are happy to offer this advice, whether you use our services or not. We are passionate about what we do and want to help you achieve a good result on air test day. This applies to individual builders and larger developments alike. We are experienced in working with individual builders and larger developers and understand the complexities of building homes, be it an individual private build or a large development. We actually want you to pass your air test first time, every time. One of our sayings is that ”we will do our best to ensure you pass your air test but we wont cheat” What do we mean by this? Well, unfortunately we have heard stories of some companies turning up to do an air test and actually not doing one, they just issue a certificate and take the money. We were recently, told an anecdote by a sound tester, that a site manager had told him, that an air tester had arrived the previous week on a particularly wet and muddy day. He wound down his window and shouted to the site manager that he didn’t fancy trekking through the mud to carry out his tests. He asked what the design air test score was and when he was told, he said, consider it done and drove off. So if this is the type of service you are looking for please don’t call us. We will provide you with a free air test check list. We will work with you on the day of the test, so if at first you do not achieve the desired result we will point out the week areas and either allow you to carry out remedial work or actually do it for you. If there is too much remedial work required to complete in a couple of hours we will provide you with a report outlining the areas that require attention and return another day to re test. We will not charge full price again and on average a re test will be at half price. So that’s how to pass an air test first time. 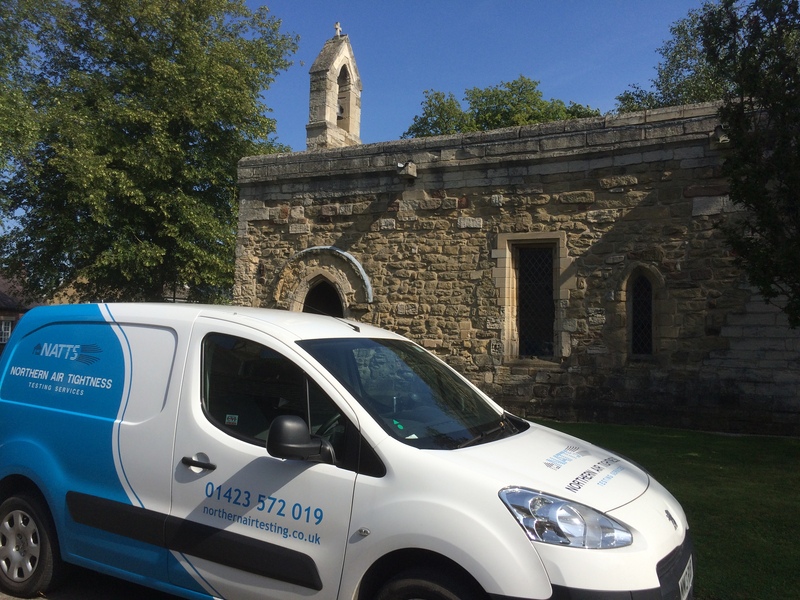 We have recently been commissioned to test the Chapel of the Hospital of St Mary Magdalen Ripon, which dates back to the 12th century. We were asked to determine the air changes per hour of the building and to identify where the air leakage was occurring. This was quite a challenge as the doorways were the typical arched type found in many Chapels of this era. We had to fit our oblong frame into an arched opening which meant quite a bit of fabrication to allow us to create an air tight seal in order to carry out an accurate test. The hospital of St Mary Magdalen is said to have been founded by Thurstan, who was the Archbishop of York from 1114 to 1228. The Chapel is all that remains of the hospital. The Church of St Mary Magdalen (now a private house) was built in 1868 on the opposite side of the road from the Chapel which served to congregation which had outgrown the chapel which then went out of use. 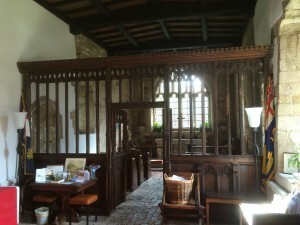 In the following years the chapel served as a farm building and has some restoration in 1897, 1917 and again in the 1980s. It was only re-consecrated in 1989. Although The Archbishop of York was clearly unaware of air testing in the 12th century, the Chapel was well built and was surprisingly air tight. 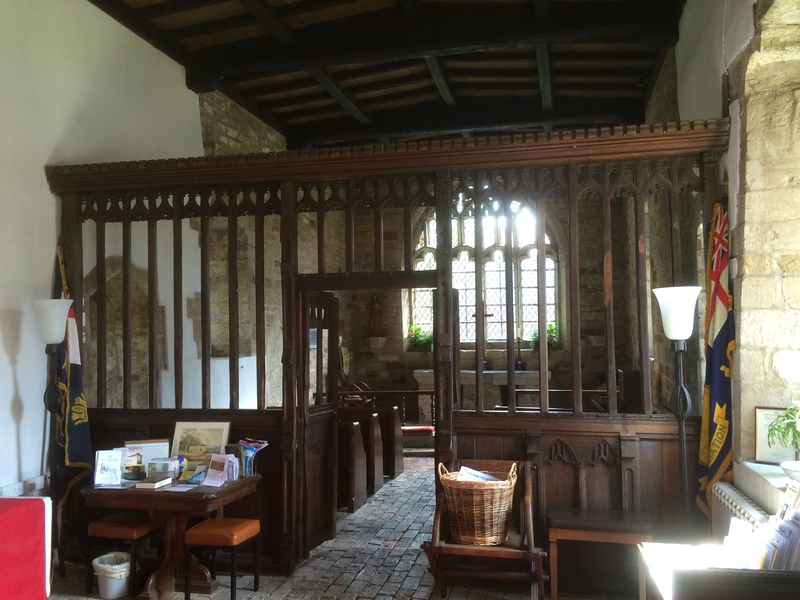 There was significant air leakage from the two wooden doorways as they were hung directly to the stone walls with no door frames so they fitted where they touched but that was about it. If the chapel was to be built today it would have to conform to current building regs and would require an air test so the current Archbishop of York would receive one of our air test check lists to pass in to his stone masons. 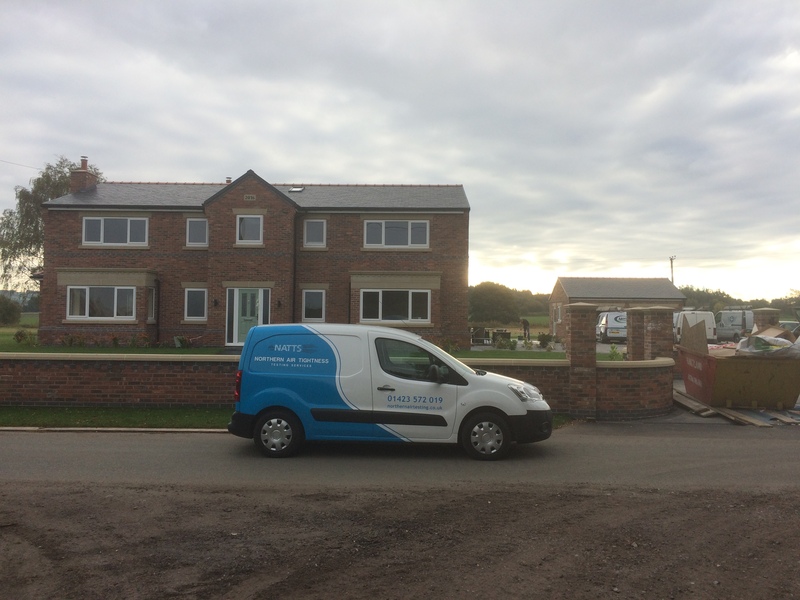 If you are planning a new build, be it a chapel or a new home check out our web site for all the information you require to pass your air test. Due to the high demand for our services in the north west we have recruited an additional air testing engineer who will be based in the Manchester/Liverpool area. This will allow us to cut down on our carbon footprint by reducing our vehicle mileage. It will also allow us to offer some great value air tests. We have been bashing out the mileage back and forth across the Pennines of late so it makes economical sense to have a base closer to the air testing demand. It seems that everywhere you turn in the north west there is a new build going up. Either a single development or a whole housing estate. It seems to be the same in North Wales where we have also been very busy of late. We have noticed recently how things seem to have improved on the large developments where the properties have been much better prepared for the air test. We tested several sites for Anwyl Construction who are based in North Wales and they are brilliant. The houses are always ready for the air test and generally have no difficulty in passing. One of the areas they are very good at is ensuring the area behind the kitchen units is finished off. IE the bottom of the plasterboard is sealed to the floor. They also do a neat job of sealing the bottom of the skirting boards which also includes the internal walls. Tips From This Blog, Air Testing North West. Download our air testing check list, its free. Seal the bottom of your skirting to the floor and include the internal stud walls as well. We also commission, test and certificate extractors, and whole house heat recovery systems.